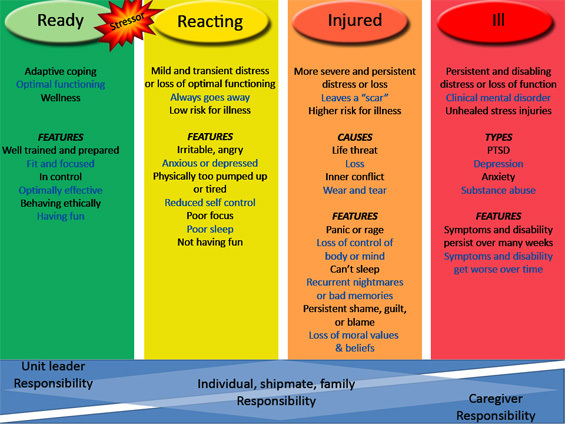 Are you "Ready", "Reacting", "Injured", or "Ill"? Where do you fall today in the Stress Continuum? These courses were sponsored by the Navy Chaplain Corps and many of whom attended were chaplains or Licensed Clinical Social Workers (LCSWs). They discussed, at the time, about creating an operational stress awareness handout so that every servicemember could easily recognize when the every day stressors of work in any situation can go from healthy and resilient to injured and/or ill with resources to contact when necessary. It takes away the stigma of "PTSD" and makes the reality of stress and its many forms recognizable in normal and unusual circumstances. Combat stress or traumatic stress or stress reaction is NOT a disorder, it is normal. Getting help before it becomes a problem is good for the individual sailor and the unit and, when back home, the family. One of the diagrams, called the Stress Continuum, is below. They have recently launched a website with GREAT resources, handouts and easy-to-access powerpoints and videos. Check it out! If you have experience some or multiple traumas, check out where you are in the post traumatic growth inventory and share your results with your primary care provider.